Downwinders at Risk is hosting a free training class on using portable air monitors on Sept. 22 in Dallas. Photo courtesy of Downwinders. A longtime DFW watchdog wants to teach North Texans some new tricks - how to monitor air quality. Downwinders at Risk is hosting a free training class on Saturday, Sept. 22, at its headquarters at GoodWork coworking space in Dallas, to teach attendees how to use portable air monitors. The 24-year-old clean air advocacy group is hoping to enlist citizen scientists for a grassroots regional volunteer air monitoring network known as the DFW Air Research Consortium. In addition, once people have attended three training sessions, they can check out the monitors for their own environmental projects. On Saturday, there will be two sessions held from 10:30 a.m. to 1 p.m. and from 2 p.m. to 5 p.m. There will be a one-hour classroom presentation followed by 90 minutes in the field, where participants will get hands on experience taking particulate matter readings. This customized training has been put together by Downwinders' PM science director Dr. Tate Barrett of UNT, as well as Cresanda Allen and Amanda Poland of Downwinders PM Committee. 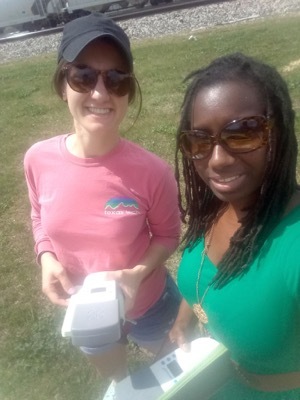 The Aeroqual Series 500 portable Particulate Matter monitors cost $1,600 each and were paid for by a Simmons Sisters Foundation grant as well as a fundraising campaign held in support of Joppa residents fighting batch plants in their south Dallas neighborhood. Shannon Gribble and Cresanda Allen using the air monitors in Joppa. Courtesy of Downwinders. According to Jim Schermbeck, director of Downwinders at risk, anyone can buy the machines online through Aeroqual or their U.S. representatives. "They come from the factory already calibrated. But in addition, we use the EPA-standard 'calibration cabinet' at UTD to make sure they stay reliable and up to EPA specs. We're also 'co-locating' them with EPA monitors to further fine tune their calibration - that is letting them sit side by side next to a $500,000 EPA monitors and seeing how close or far they are to mimicking its results." “The hardest part is being attentive to what’s normal and what’s not normal,” she said. For example, when a large truck passes by, the sensor spikes. Temperature, humidity and wind speeds also must be factored in. As for what constitutes a safe particulate matter reading, there is “no safe level” of particulate matter, according to a 2017 study by Harvard School of Public Health of 60 million people, and the effects of PM exposure. Researchers found that harm is done by exposure at even the lowest level tested, five micrograms per cubic meter of air. The U.S. Environmental Protection Agency standard allows more than double that, 12 micrograms per cubic meter. Mayo said they plan on making these training sessions a regular offering. About: Learn how to use portable handheld air monitors to collect air samples and monitor particulate matter. When: Sept. 22. The class is offered twice - from 10:30 a.m. to 1 p.m. and from 2 p.m. to 5 p.m.
Where: Goodwork coworking space, 1808 South Good-Latimer, Dallas.